Blog from Rotorua, New Zealand | Margaret in Wonderlands.. The next day we went to the Whaka- Whakarewarewa which was not far from Rotorua. A historical Maori village and geothermal village. There me, Katie, David and Sarah Jane went for our designs for tatoos (hopefully) We were a little panicked as we only had an hour and a half and Timmy had not booked us in for it and the guy doing it was not about. Luckily he turned up and we got to speak to him. He asked us about our family trees and information about us on the whole. I mentioned about the great friends and cousins I have. So this could be referenced. I also mentioned the other things I think makes me and things I hope for the future. It was really cool and he is now turning it into a design which I hope to get put on my body one day. I always wanted a tatoo and after this life changing experience I think its time I got one :) He is going to email it to us and send one in the post. After this we went for a look around the village at the mud pools and the gas coming out of the rocks. It was pretty amazing as well as smelly but not as bad as I thought it would be. Some of the pools get up to 100degrees so this is very very hot!! There was one pool which was called Grumpy old man. We went around a few more areas with the tour group. There was a lady who was a descendent to 7 of the boats that landed here and she actually ended up in Oxford uni studying and writing a book about Maori traditions. It was an interesting village and experience. They then threw in some hangi dinner of corn on the cob, bread and sausages. Over 35% of the population in the area is Maori so you will see plenty of signs of the culture. 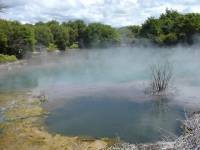 You'll also notice the smell of rotten eggs - which is caused by sulphur, which is caused by the earths crust being thin here and leading to a lot of geothermal activity. The culture, the boiling mud pools and shooting geysers make Rotorua a big tourist attraction. Back in the day it was famous for pink and white terraces which were located near Mount Tarawera on the edge of Lake Rotomahana and was being coined as the 8th wonder of the world. They were made up of silica based terraces filled with geothermal water. They were destoryed by the eruption of Mount Tarawera in 1886 which also destoryed nearby villages and killed about 120 people. Many homes were able to take advantage of the natural resource with private bores allowing them to do everything from heating their houses to having private geothermal pools. It used to be a bit of a free for all until the 80's when the council noticed that all the private use was reducing the level of geothermal activity throughout the city so put a restriction on private use. Wairakei is one of seven geothermal power stations in NZ. Built in 1958 it was only the second geothermal power station in the world and first to use superheated geothermal water as a steam source for turbines. The steam is produced by drilling into the underground stream system and releasing the great pressure which is on the very hot water that causes it to boil. The stream is created travels down the lines at speeds of up to 60m per second. The loops and bends and spaces between the pipes are to allow for the expansion of the steel as it heats up and cools down. Wairakei produces about 5% of the North Islands electricity needs. After this we headed into central Rotorua and did a quick shop. I popped to pack and buy to buy some bits but on the way back I saw the Stray bus pull out and leave me. I could not believe Tim would leave me, I started to run or should I say hop after the bus but I realised I would not catch up. I knew he was getting pissed off with people being late but I could not believe he would leave me and all my stuff was on the bus. I had a purse and camera and odd bits but all the other bits i.e. passport and phone were on the coach. I then tried to think tactically and went to the cross roads for the road to Taupo. I thought then I could wave him down and jump back on. After about 20 mins i was convinced he had left and was considering ringing the base and getting them to call him. It was then I spotted the orange bus and I saw it was turning towards me. I found out after he had miscounted or someone was there, that was not on the bus at the time of counting. It was only when Laura spotted I was missing and my stuff was there did they realise. They played a game called 'Where's Margaret' and the bus were all involved in trying to spot me in Rotorua. Apparently Tim spotted me quite quickly and all was good but I was a little panicked. Only because all my stuff was on the bus. Anyway I got on the bus and we all had a good laugh about it. We then headed off to some mud pools which were spitting out loads of bubbles and were steaming. Our next stop was a secret location was a hot spring and waterfall. There was a sign to say there is meningitis in the water so not to get to close but I dipped my feet in the mud and water. After this we dropped people to the skydives, bungees and other sites. We also passed through Huka Falls which is one of NZ's most visited attractions located on the Waikato river and while only 11m high they are famous for the speed and volume of water. Every 3 seconds enough water flows through to fillan Olympic sized swimming pool. We then got dropped to Urban Retreat where we had a really cool evening and watched peoples skydive dvd's. It was the last night most of us would be together. We had dropped a big group to Rotorua so we were losing part of the group. I was staying for 3 nights in Taupo to chill out. In 181AD the volcanic crater erupted causing such a mess that its effects on the weather and sky were recorded in ancient Rome and China, After the massive explosion of the crater the resulting hole filled with water anc created Lake Taupo, the largest lake in NZ (which is about the same size as the whole land area of Singapore).